Ise Kadoya Summer Beach IPA is a 6% American IPA from Ise Kadoya, based in Mie, Japan. It’s part of their summer seasonal lineup of beer, and can be found in both bottles and on tap when on sale. Ise Kadoya Summer Beach IPA is brewed using 8 different hops: Authanum, Cascade, Centennial, Polaris, Ekuanot, Waimea, Summer, and Falconer’s Flight. Ise Kadoya Summer Beach IPA came out a golden yellow colour with a slight chill haze to it, along with a frothy white head on top. It had a tropical fruits aroma of pineapple, mangos, oranges, and lemons, with very little malt coming through. What malt that did come through smelt biscuit-like but it was really faint. It didn’t really evoke images or memories of sitting on a beach in a tropical setting but I’m a mountain kind of guy. The initial bitterness came on strong but faded fast – and that was the story for most of Ise Kadoya Summer Beach IPA. The tropical flavours of pineapple, mango, and orange came through but faded fast from the palate and left a weird funky bitterness. Perhaps some jaded summer memories for the brewers at Ise Kadoya. It finished off with some wet cardboard like quality to it and a lingering off-bitterness to it that I was glad to be rid off. 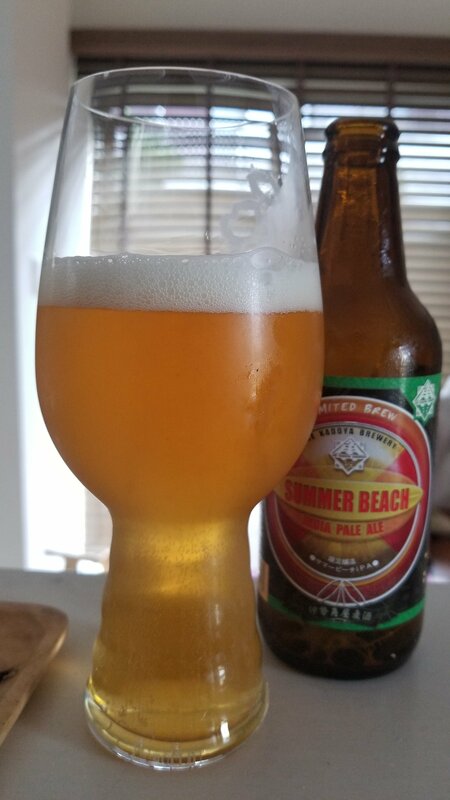 Ise Kadoya Summer Beach IPA is not one of Ise Kadoya’s better efforts to be honest – very hard to recommend this over their other IPAs.